For freshman Jasmine Ponce de Leon, this presidential election is a big deal. Not only will it be her first time voting, but her father’s as well. Ponce de Leon, who lives on campus, originally planned on making the six-hour trek home to Carson, Calif. to vote because she was confused about where she could vote in San Francisco. Now she doesn’t have to. For the first time in three years, SF State will have a polling place on site so students who live on campus, like Ponce de Leon, can cast their ballots without having to go out of their way. “That makes life so much easier,” Ponce de Leon said. This would have been the first presidential election without a polling place at the University, according to Paul Murre, president of California College Democrats. The San Francisco Department of Elections originally decided to move the polling place to Temple Baptist Church on 19th Avenue because the department had problems finding a reliable campus location in the past, the department’s spokesman Evan Kirk said. “We inform voters of their polling place location about a month before Election Day, and while some cancellations or relocations are unavoidable, our past experience included elections where SF State staff attempted to switch locations on the day before the election without any prior notice to the department,” Kirk said. Shawn Whalen, SF State’s deputy chief of staff in the Office of the President said that the Department of Elections never communicated its concerns firsthand about the University switching the polling place’s location without notice. The University’s Office of Government and Community Relations first heard back in August that the Department of Elections planned on moving the polling place off campus and brought the matter to the Office of the President’s attention. “We just wanted to make sure we could do anything we could to get a polling place on campus,” Whalen said. Jared Giarrusso, associate director of the Office of Government and Community Relations, said that the Department of Elections wasn’t willing to push for an on-campus polling location. University administrators and Associated Students, Inc. contacted San Francisco supervisors who spoke to the department on SF State’s behalf. University President Leslie E. Wong wrote Mayor Ed Lee a letter trying to encourage him to get the Department of Elections to change its mind about the polling place’s location, Whalen said. Whalen contacted Supervisor Eric Mar, former Asian American Studies lecturer at SF State and Senator Leland Yee. Various University clubs and students also contacted Mar’s office when they found out there wasn’t going to be a voting place on campus, said Peter Lauterborn, Mar’s legislative aide. Mar voiced his concerns with the Department of Elections and within a week, the parties had worked out a way to get a polling place reinstated on campus. “SF State is now working with us on the necessary details of establishing a polling place on campus, and we hope to maintain a positive and ongoing relationship with them,” Kirk said. 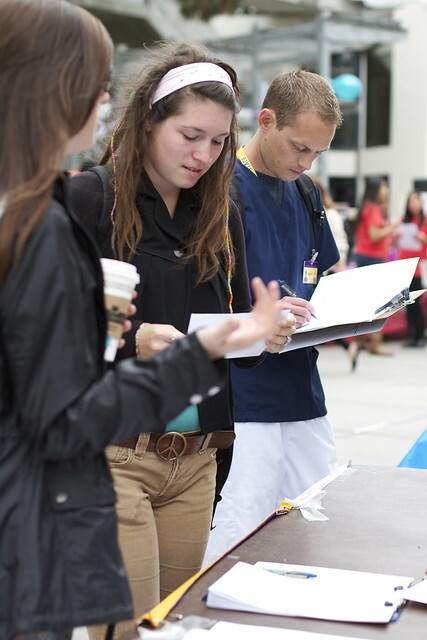 Murre was among the students to contact SF State’s Office of Government and Community Relations, as well as Mar. He felt it was important to get involved because he was concerned that not having an on-campus polling place would disenfranchise student voters, who are most likely voting for the first time. “This election is critically important for young people. Our future is on the line,” Murre, 21, said. Murre, a political science major, wanted to make sure voting could be as easy as possible for student residents since there are many important decisions on this year’s ballot, like Proposition 30. If Prop. 30 fails, a $250 million trigger cut to the CSU system will go into effect, which the CSU Board of Trustees will attempt to offset with a 5 percent tuition increase. 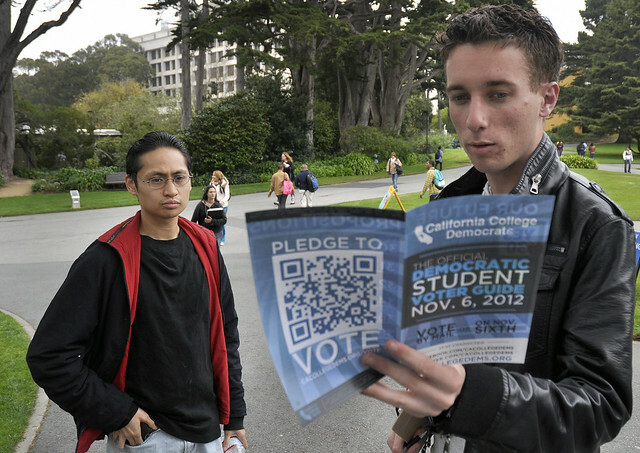 Like Ponce de Leon, other first-time voters who call SF State home are happy they can cast their ballots on campus in the general election. “It makes the whole process a lot faster,” said freshman Collin Mori, who plans to major in business marketing. While most freshmen seemed to appreciate the convenience of being able to vote at school, other students said they were not planning on voting because they were not sure how the election is going to affect them. “That stuff doesn’t interest me,” marine biology major Crystal Kobierski said. But Ponce de Leon knows how important this election is. Ponce de Leon’s parents, who are originally from Mexico, don’t have the opportunity to vote because they are still in the process of getting U.S. citizenship. Her father recently obtained his citizenship, so he will be able to vote for the first time in the U.S. with his daughter. “‘You are given this gift that we don’t have, so you should do it,'” Ponce de Leon said her mother would say. The proposed location for the polling place is the Presidio/Richmond Room inside the Towers Conference Center, according to Kirk. Check the Department of Election’s website in early October to find your polling place.